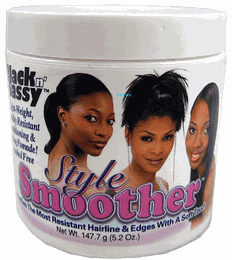 Black N Sassy STYLE SMOOTHER - 5.2oz jar Smoothes the Most Resistant Hairline & Edges with a soft Touch. Blackn'Sassy a light-weight, humidity resistant conditioning & Styling Pomade! ALcohol Free. For Truly great, Smooth styles try Blackn Sassy Style Smoother instead of gel. YOu will get all the hold you need without the dryness, itch or flakes. PLUS! A Perfect Soft Feel With a Fantastic Polished Shine. Wash out easily! !